In order to board any international carrier travelling to the Schengen Area, nationals of visa-free countries will be required to bear a valid ETIAS to be checked prior to embarkation. Since the objective of the ETIAS is gathering information to facilitate migration-related decisions, the online application will be straightforward, taking about 10 minutes to complete. 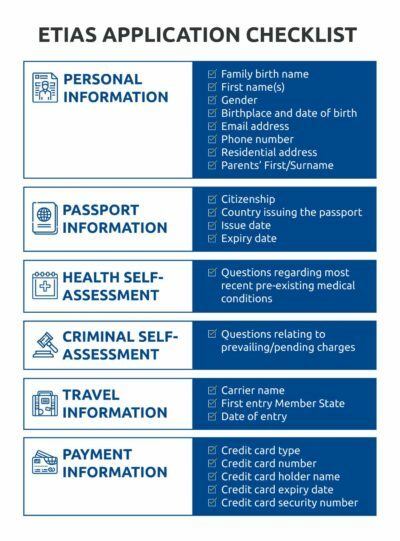 All Canadian passport holders will have to fill an online form with personal data as well as respond to a questionnaire concerning criminal records, travel history, relevant medical conditions and other relevant information. They should also specify the Member State of arrival in which their ETIAS will be registered into, making sure to enter the Schengen Zone from that particular country. Finally, they should use a Credit or Debit card to pay the processing fee – noting that Canadians under 18 or above 70 years-old are exempt from payment. Once the application is submitted, the information will be cross-checked with that of other international organizations before a decision is made. The estimated processing time will range from only a few minutes up to a maximum of 96 hours. If accepted, the authorization will be valid for 3 years from the date of issue or until the registered passport expires. The ETIAS will work as a multi-entry authorization, allowing Canadian visitors (with the sole purpose of tourism) to stay in any of the countries of the Schengen Area for up to 90 days in every 180 days. Despite bearing a valid ETIAS the final decision comes down to the border officer at the given port of entry. The application for an ETIAS will be done online, via the official website (to be announced). When requesting an ETIAS, every applicant will be subject to the same process which should be done at least 3 days (72 hours) before departure – however, the earlier the better. All travellers are urged to provide only true information and refrain from adapting answers for the sake of a better chance of approval. Any false declarations will ultimately lead to a refusal of the ETIAS and entry into the Schengen Area. Applicants are also prompted to review the information after each step, ensuring that all data is accurate and there are no spelling mistakes. Once submitted, the application will be verified by the ETIAS system to evaluate if the traveller poses any migration, public health or security risk to the European Community. The ETIAS data will then be automatically crossed with data from other international bodies – such as Interpol and European Border and Coast Guard – in order to determine the existence (or not) of a security threat and subsequently the acceptance or refusal of the authorization. If approved, the ETIAS will be sent via email; otherwise, the applicant will receive an email informing the reasons why the authorization has been denied. In case there are issues with the application, the process will be carried out manually by an ETIAS agent of the Member State in question, who may inquire for more information. When provided with the info, the authorities will have a period of up to four weeks from the initial request to make a decision. If the application is denied, the traveller has the option to appeal. For those who have been granted an ETIAS, it is advisable to print at least 2 copies of the document and have it handy throughout the duration of the trip. Also, it is important to bear in mind that an ETIAS can be revoked at any point during its 3-year-validity, so it is up to each traveller to check whether their authorization is still valid prior to boarding. The main requirement for ETIAS eligibility is that the traveller is a national from one of the countries currently in the Schengen visa-waiver agreement. In the case of Canadians, this is simply proved by bearing a valid Canadian passport. Since the ETIAS application will be done online, there is no need to post any documents, only have a scanner or camera to digitalize and attach copy when required. All information documents must be updated and accurate since, in some cases, the applicant may be required to provide further details to verify the data submitted.